We’d love your help. 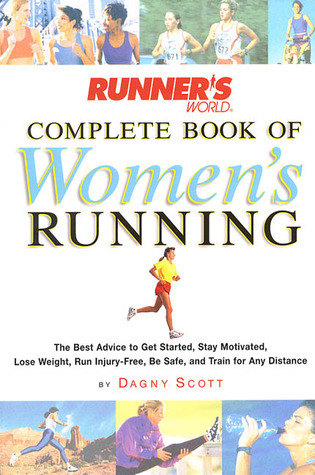 Let us know what’s wrong with this preview of Runner's World Complete Book of Women's Running by Dagny Scott Barrios. Women develop a special sorority on the roads. This bond is an understanding based on acceptance, an appreciation of how far they have come, a knowing wink that says how much is yet to be gained. And so they talk and share and grow-- and run. Singly and in groups, swiftly and slowly, they run." To ask other readers questions about Runner's World Complete Book of Women's Running, please sign up. I also wish I had learned some more useful tips about race nutrition. The author is really a big believer in "a bagel and a banana" and that's sort of the extent of what she recommends for running days. There's a section on energy gels/drinks -- and how they may or may not be palatable -- but there are no suggestions for "real" food alternatives during a race. Keeping in tune and studying something that you love to do so much definitely benefits your attitude about the subject. Occasionally, I get sour about going out and hitting the pavement, especially when it's raining and nasty outside. But after reading a few pages and nodding the entire time in agreement with what the author is saying about running just affirms your passion for it. I would recommend this book for runners of ANY level, not just beginners. Really helpful, great read. I'm not going to follow her training plan exactly, but would recommend the book! For a book with more information than really applied to me, I still read it cover to cover. Even the training plans that I won't be ready for for awhile. But it's inspiring to read the personal anecdotes from amateur as well as professional runners, including the author. For information for young women to older women, this is a pretty handy go-to. My only complaint is that some of the exercise descriptions were a bit confusing, but the pictures helped. As a beginning runner, I found this book to be incredibly informative, helpful, and motivating. Not having a background in running, I found that the language was easily to follow, concepts were well explained, and I took away many helpful tips to strengthen my future as a runner. In addition to this, the book is full of personal stories from women runners that provided inspiration and motivation for me along the way. I bought this as a reward for myself sometime last year in terms of meeting my running goals. I was pretty disappointed. Browsing through it in the store I thought it would be helpful as I started to enroll in more races. Like most other people, once I got to the line "plodding along at a 9 minute mile", I put the book down and never finished it. There is a strange gap of this is for the extremely new beginner to running, and then we speed straight off to breaking time records. Her programs were I bought this as a reward for myself sometime last year in terms of meeting my running goals. I was pretty disappointed. Browsing through it in the store I thought it would be helpful as I started to enroll in more races. Like most other people, once I got to the line "plodding along at a 9 minute mile", I put the book down and never finished it. There is a strange gap of this is for the extremely new beginner to running, and then we speed straight off to breaking time records. Her programs were way too intense and I used absolutely none of them (for the record, I ran the Dopey Challenge at Disney - 48.6 miles - just fine on my own). If you are a complete newbie to running, this book will definitely be helpful as it collects all the most commonly asked questions in one place and answers them in a way that every beginner would understand. In sum it's just a comprehensive collection of information that one usually finds in a women's magazine. If you have been running for a while or have some knowledge on running, the book is not very helpful as it offers no scientific information or other in-depth data. But if you are looking If you are a complete newbie to running, this book will definitely be helpful as it collects all the most commonly asked questions in one place and answers them in a way that every beginner would understand. Excellent resource for beginners; much of the information presented is practical and would alleviate anxiety of a woman new to running. Some of the tips I disagree with...mainly the suggestion that cotton tees are fine for most runs. What?! Get a moisture-wicking tee and you will feel so much better during and after your run. I really enjoy this book. I say "enjoy" due to referring to it over and over. A great resource for runners of every skill level. Great source of information--had what I was looking for as a person who can run comfortably and is looking to run more. Every year i start with this book to get my running skills up. Easy to take to the road or on a treadmill. If you ever wanna start running this is the book for you. Found helpful tidbits of information, but feel this book is definitely for a beginner runner just getting started. What I like about this book is that it is strangely comforting. I already have 8 books listed on my "Curently Reading" shelf, but always have a couple extra that I keep around and pick up at random without adhering to reading with a specified approach. This is one of those radom "floating" books. Once it became clear I was reaching for it more often than expected, I found it needed to be added to the online list. I originally started skimming this book to get a quick general overview, a few othe What I like about this book is that it is strangely comforting. I already have 8 books listed on my "Curently Reading" shelf, but always have a couple extra that I keep around and pick up at random without adhering to reading with a specified approach. This is one of those radom "floating" books. Once it became clear I was reaching for it more often than expected, I found it needed to be added to the online list. I originally started skimming this book to get a quick general overview, a few other opinions on training approach and mindset, etc. I truly don't think the running information is all that extraordinary, but I've oddly found that I reach for it as a comfort. Somehow the writing she includes identifying running as the emotional ribbon that ties her life together and gives meaning to her person has a very familiar ring. She includes most of this writing in the "Training Log" boxes. I am not an overly emotional person. (I generally hate sappy books and romances, and feel that over attention to emotion in books is usually completely beside the point and is over used as a crutch or a way to fill pages and rope in uncommitted readers, etc. Agree or disagree, that's what I typically feel). While I am not an overly emotional person in what I chose to read, I have found these litle "Training Log" boxes speak to me on a level I never would have expected from a run-of-the-mill soft cover book from Runner's World. The little "Training Log" slices have identified why I feel oddly drawn to doing this. They have put words to why running isn't important due to all the established physiological benefits of exercise or even all the pride you may feel after running a personal best. Running is important because you walk through the store in the afternoon differently after running 10 miles that morning. You conduct yourself differently due to a change in your mentality, not due to physical soreness. Running that 10 miles forces you to build something small that has evolved in your brain. You think and feel and move differently knowing that you did something no one needs know about to see the change in your demeanor. It re-routes your thoughts into a loop based on the clear evidence that you accomplish things the great majority of people would be slightly horrified to consider. This rebuilds you from the base. A great book - I've always wanted to be a runner, but never really knew how to start. I downloaded a C25k (couch to 5k) podcast which helped me get started gradually, but as far as the more technical aspects, I was clueless. What's the proper form? Does stretching really matter? Is running too high-impact? (Answers: it depends, yes, and not typically). This was a great book for both beginners and even more advanced runners; the chapters were thorough yet concise, and were filled with nothing but A great book - I've always wanted to be a runner, but never really knew how to start. I downloaded a C25k (couch to 5k) podcast which helped me get started gradually, but as far as the more technical aspects, I was clueless. What's the proper form? Does stretching really matter? Is running too high-impact? (Answers: it depends, yes, and not typically). This was a great book for both beginners and even more advanced runners; the chapters were thorough yet concise, and were filled with nothing but practical info. I especially liked that the author was so unpretentious - she covered everything from why women have to pee so much when they run to dealing with common injuries and choosing good running shoes, to staying motivated. She's an advocate of listening to your body, and allowing it to dictate things like whether you should drink water while running or not (my husband and I got into an argument about this - he thinks it's silly to take water on shorter runs; I begged to differ). A comprehensive guide to running... I would say great for beginners and more competitive runners. There is good wisdom and motivation for runners at all levels, and I can't wait to share some with my running buddies! As a long-time recreational runner, there were a lot of great tips for me, and things that I remember learning in high school track and cross country but have since forgotten. And I'm all pumped to get running! I just learned that women runners will go through menopause earlier! But A comprehensive guide to running... I would say great for beginners and more competitive runners. There is good wisdom and motivation for runners at all levels, and I can't wait to share some with my running buddies! As a long-time recreational runner, there were a lot of great tips for me, and things that I remember learning in high school track and cross country but have since forgotten. And I'm all pumped to get running! I just learned that women runners will go through menopause earlier! But symptoms are lessened. I also got insight on how some can run for such incredible amounts of time... They have to start snacking as they run! Wow... And competitive runners do more than one run a day, like a morning and evening one. I appreciate the emphasis on rest days, and learned that you should do your last big run a week or two before your race and take it easy then... Your body needs that time to get stronger, "repairing muscle damage,topping off your fuel tank, and boosting your energy". I loved this book. I actually read it last night and it was an easy, but informative and motivating read. Not being new to running, I could absorb the information with ease, but also rediscovered some important elements that I'd forgotten since buying my first pair of proper running shoes and hitting the road. I checked it out of the library, but this is a book that I would really like to own. My favorite aspect of the book is that it helped me remember why I *do* like running, why I turned to it I loved this book. I actually read it last night and it was an easy, but informative and motivating read. I checked it out of the library, but this is a book that I would really like to own. My favorite aspect of the book is that it helped me remember why I *do* like running, why I turned to it in the first place, and where I can take it from here! There is a training program in it for joggers who want to become runners and I'm feeling like I want to give that a try. I'm not currently training for any run, so this will be a fun diversion. I recommend it for any woman who already runs or never has but thinks she might enjoy it. I did not read every word of the book; I skipped the marathon sections and some other information that was not currently relevant to me. Overall, I found this book to flow better than another Runner's World compilation title I read. The balance felt good and like it was in accordance with my skill level too. I didn't feel that the information was way out of my reach, or that it was way too simple and that I was beyond it. I especially liked the chapter detailing how to advance to being an "interm I did not read every word of the book; I skipped the marathon sections and some other information that was not currently relevant to me. Overall, I found this book to flow better than another Runner's World compilation title I read. The balance felt good and like it was in accordance with my skill level too. I didn't feel that the information was way out of my reach, or that it was way too simple and that I was beyond it. There needs to be more of these books for women, just updated. The author was definitely heavily leaning towards competitive running, which is a shame as very few of us are actually elite runners. There was a lot of information, a little dated, but a lot of information, the only information serious lacking was running for older runners, but I suppose in 2000, we were a rarity. I need a book for a mediocre older runner, :) not recreational, not elite. But I will continue to run and this book had There needs to be more of these books for women, just updated. The author was definitely heavily leaning towards competitive running, which is a shame as very few of us are actually elite runners. There was a lot of information, a little dated, but a lot of information, the only information serious lacking was running for older runners, but I suppose in 2000, we were a rarity. I need a book for a mediocre older runner, :) not recreational, not elite. But I will continue to run and this book had some information to shelve in my memory. Lots of good information here. I'm not sure why it's not quite a 5 for me. Maybe I'm too much of a beginner for this book? The training plans were, like, whoa. If you're running 4 days a week or more and running a full 6 miles and then some, you will probably find this book EXTREMELY helpful. If you're more of a novice like I am? You're still going to find the book helpful, but you're not going to relate as well to the author. Also, I think I was a little disappointed in the weight loss section. Lots of good information here. I'm not sure why it's not quite a 5 for me. Maybe I'm too much of a beginner for this book? The training plans were, like, whoa. If you're running 4 days a week or more and running a full 6 miles and then some, you will probably find this book EXTREMELY helpful. If you're more of a novice like I am? You're still going to find the book helpful, but you're not going to relate as well to the author. I enjoyed this book not only for the practical advice but also for Scott's intelligent and realistic attitude towards women athletes. She is never condescending, even towards the more recreational of us, and touches on some very important ideas in terms of women who strive towards excellence (conflict with men, conflict within ourselves, finding the time etc.). An excellent read for anyone looking to get more serious about their running, especially those who think they can't get beyond that firs I enjoyed this book not only for the practical advice but also for Scott's intelligent and realistic attitude towards women athletes. She is never condescending, even towards the more recreational of us, and touches on some very important ideas in terms of women who strive towards excellence (conflict with men, conflict within ourselves, finding the time etc.). When I decided to start running, like the geek I am, I ran out... and bought a book on running. I got a lot out of it, most notably the importance of good running shoes, and various other tips like what/when to eat surrounding your run. Much of the book didn't apply to me (ie: running for the older woman, running for the pregnant woman) so I just skipped those chapters. Who knows? Some day they might be applicable to me (not anytime soon in either case, lol). Dagny Scott Barrios is a writer, editor, and public speaker specializing in running and women's sports.